"Its hard to sit down and write to my forever friend that I have known since chil"
Patricia Karen Nearing of McCleary passed away Friday, August 24, 2018. She was 77. Patti was born in Ketchikan, Alaska, April 23, 1941. She loved being able to go back and visit. She often shared stories of her childhood there, and treasured that time in her life. On May 16, 1959 she married Leonard R. Thomas, and had three children. They later divorced. On April 23, 1980 she married Earl “Pinky” Nearing. They resided at their home in Aberdeen. Pinky preceded her in death September 18, 2007. Patti held a variety of jobs from 1968 through the early 1980’s. She worked in Juneau for the State of Alaska for 1 year, 5 years at Eddie Bauer, and a cook at Gambers until 1979 when she joined her brother’s business at Mikki’s Tavern. At Mikki’s Taveren Patti was well known for making the best burgers. 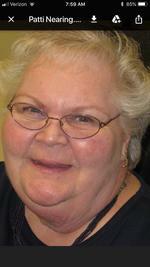 Patti was volunteered at Grays Harbor Community Hospital for the last ten years and was named Volunteer of the Years. She was also a member of RSVP. Patti was a very caring person, and she loved her family and friends unconditionally. People often sought her out for her advice and support, and she was always willing to give it. Patti would go out of her way to help people. She also enjoyed having fun and laughing, and is known for her wittiness. Patti enjoyed camping and spending time with her family and friends at her and her husband Pink’s property at Pacific Beach, and later at her brother’s property in Matlock, which the family named “Hooterville”. She also enjoyed clam digging, canning, gardening, and traveling with everyone she loved. She was always up for a trip to Reno, Hawaii or Las Vegas. Patti also enjoyed baking and cooking. Every year during the holidays her family and friends looked forward to her cookie trays and cinnamon rolls. Recently Patti moved to McCleary and resided with her daughter Cheryl in a new home they had built. She enjoyed sitting in her chair, and enjoying the peaceful view of the hillside, and seeing wildlife in her backyard. Patti is survived by her children Don Thomas of Aberdeen, Cheryl Thomas of McCleary, Kevin (Christy) Thomas of Olympia, and stepson Jim (Meratta) Nearing of Aberdeen; sisters Sue (Pete) Peterson of Renton and Mary (Brett) Rankin of Tacoma; 10 grandchildren; and 15+ great-grandchildren. She was preceded in death by her husband Earl Nearing, brother James “Mikki” Barkell, and parents James and Ellen Barkell. A celebration of Patti’s life and potluck will be held from 1-4 on Saturday, September 29, 2018 at the McCleary VFW, 158 N Summit Rd. To share memories or express condolences please visit www.harrisonfamilymortuary.com. Arrangements by Harrison Family Mortuary. To send flowers to the family of Patricia "Patti" Nearing (Barkell), please visit our Heartfelt Sympathies Store.